"Galilean Nights" is part of a wider project called "Galilean Week" (17-24.10.2009). During this period we will organize public presentations and sky observing through the naked eye & telescope. Also, we will hold a 3-day workshop called "Introduction to Astronomy". The target is composed of people who are absolute novices, but who want to know more than what you can tell them in a normal observing session when you have 100 persons in a queue waiting to see Jupiter through telescope. There will be held presentations about Galileo Galilei and we will point our telescopes to the Moon and Jupiter. Organising Group: National HighSchool "Emil Racovita"
Students at National HighSchool "Emil Racovita", leaded by Mrs. Irina Caragea will organise an exhibition of their own drawings of the Solar System and share data about the stars and planets with people in the park. Public observation by telescopes in Cismigiu Park. Our school organised a trip to the Astronomic Observatory from the Children's National Palace in Bucharest,where the students took part in two interactive work-shops about Galilei's discoveries 400 years ago and about modern telescopes and also made sky observation. They went next to the Planetarium in Pitesti,where studentstravelled virtually through the Solar System and enriched their knowledge about astronomy and felt nearer the stars. Observatii astronomice pentru public cu ocazia evenimentului "Nopti Galileene". Membrii astroclubului Borealis, STARMAX Astronomie si, speram, Observatorul astronomic al UBB vor organiza sesiuni de observatii astronomice si prezentari multimedia gratuite pentru public. Conferences and public observations in cooperation with Astroclubul Borealis and STARMAX Astronomie. A special Galilean Nights edition of TV broadcast Noi si Cerul will be at Columna TV on October 24. 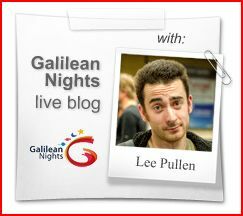 Also, Cultural Radio Romania will present a special Galilean Nights audio spot. A Press Conference for Galilean Nights event will be held on October 22 at 13:00. A special Press Conference with all mass-media from Targoviste to present the Galilean Nights project and the program of activities in Targoviste. The event will be organized at the Central Office of SARM. Venue: Colegiul National "Carol I"
Acţiunea "Urmează-l pe Galilei" va fi organizată în acelaşi stil ca şi "Stargazing" din cele 100 de ore de astronomie şi va fi compusă, cu sprijinul fenomenelor meteo, din două seri de observaţii astronomice, în 22 şi 23 octombrie 2009 între orele 20 şi 23 aproximativ. Observaţiile vor avea loc în curtea Colegiului Naţional "Carol I" din Craiova şi vor fi asistate de subsemnatul şi echipa de elevi a clubului "Astrobotic" ce funcţionează ca activitate extraşcolară gratuită în cadrul colegiului. Aparatura utilizată va fi compusă cel mai probabil din Celestron Sky Scout- planetariu personal, telescop 254/1200 pe montură Dobson fabricaţie proprie, lunetă fabriciaţie proprie pentru a verifica cele văzute de Galileo Galilei, probabil un alt Dobson GSO de 200 al unui coleg amator entuziast şi eventual un binoclu. Pentru eventualitatea în care vremea ne va fi duşman voi încerca prezentarea unei serii de filme cu ajutorul unui videoproiector în sala de festivităţi a colegiului. Sunt invitaţi toţi elevii dornici să redescopere cu ochii lor sistemul nostru Solar refăcând parţial observaţiile marelui Galileo Galilei. Sunt de asemenea bineveniţi părinţii şi cunoscuţii lor. Vă aşteptăm la 44.319063, 23.792046 în zilele şi orele menţionate. Cer senin tuturor! Organising Group: School no 14 "Ion Tuculescu"
School activities about Galileean Nights and sky observation. We are going to present a documentary film created by ESA; after a few discussions and further explanations on the film, the students will have the opportunity to use their galileoscopes and if the weather is good they will make some observations. Parents and teachers can join our activity. Observatii astronomice prin telescoape pentru public. Our event is made with collaboration of few school in town (Colegiul National Dragos Voda, Scoala Dr. Ioan Mihalyi de Apsa, Grup Scolar pt. Industrie Mica si Servicii) and media partners (eMaramures - http://www.emaramures.ro). Prezentari multimedia in Cetatea din Oradea; observatii astronomice pentru public. - Teaching materials leaflet: File video taken from the series of online conversations and illustrations entitled:-A constellation above us. - Rapporteur: the Italian professional astronomer Giorgio Bianciardi. Conference and presentations about the galilean objects: Sun, Moon, Jupiter and others. Mini astrophotos exhibition. Images Projections. Public observations by telescopes. Venue: Conferinţa "Tehnici de observare a corpurilor fără atmosferă din Sistemul Solar"
1. Tricolorului Square, 22-24 October. A festival in open air: big tents and stands with astronomical products, images and film projections, 3D images, planetarium program projection, debates, workshops, astroelectronical music, remote observing. Day and night telescope observations at Sun, Moon, Jupiter and Pleiades. Astronomical drawings contest. 2. History Museum, 24th October, 17:00-18:30. Exhibition of astrophotography. Special Galilean Show: International Galilean Poetry Evening and Astrofolk Music Show. 3. Columna TV Studio, 24th October, 15:00-16:15. ”Us and the Sky” special TV live Broadcast dedicated to the Galilean Nights. A special astroshow dedicated to Galileo: international galilean poetry and astrofolk music. An astrophotography exhibition with images made in the IYA2009 events organized by SARM during 2009: TWAN expeditions, Perseid Camp, Astronomy 2009 Camp. We will have planetarium presentations, astronomy presentations, free discussions with the public based on astronomy topic and observations with astronomical instruments if the weather permits it. The event is held in partnership with The Astronomical Observatory of Timisoara, UVT -Universitate de Vest Timisoara, and Altair Astronomy Club Timisoara. Street/Description: Axente Sever No 1. The event will consist of mixed activities taking place both at the Timisoara Planetarium (inside the West University) and at the Astronomical Observatory. Each day during the event around 10:00 attendees will enjoy the Planetarium presentations. Later in the evening, starting around 18:00,some presentations on Galileo's work will be given at the Observatory. If the wheather permits the presentations will be followed by astronomical observations. The event is a joint initiative of the Antares Astroclub, West University of Timisoara, Astronomical Observatory and Altair Astroclub. At the observations will be present students, teachers, parents, public. In case of a cloudy sky, it will be presented: the history of astronomy and the Hubble telescope discoveries. Venue: Colegiul Tehnic "Al.Papiu Ilarian"
Organising Group: Colegiul Tehnic "Al.Papiu Ilarian"
-22 octombrie, 18:00–24:00, observaţii astronomice: Luna, Jupiter, stelele cerului de toamnă şi poate şi altele, în funcţie de poziţia pe cer, cu lunete si telescoape care se vor instala pe terenul de sport din curtea scolii. -23 octombrie,10:00–22:00,excursie la Planetariul din Baia-Mare cu elevii care au participat la actiunile desfasurate in proiectul "2009-Anul international al astronomiei".